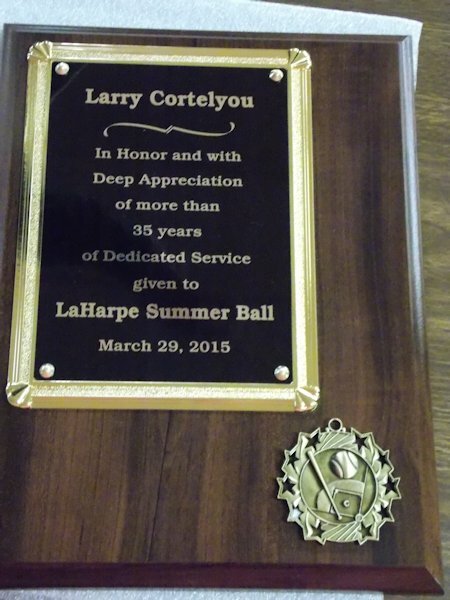 For 35 years, Mr. Larry Cortelyou, who was instrumental in getting and keeping the La Harpe Summer Ball Program, has devoted countless hours of work and dedication to this successful park project. On Sunday, March 29, 2015 he was presented with a plaque by Randy Shumaker and Barry Wright for his faithful work as he hands over the program to Randy Shumaker. Cortelyou said, Maybe he (Randy) will still let me help a little bit. Cortelyou and Jim King started the program in 1978 when Cortelyou's son was six years old. All I did was co-ordinate everything. The community did all of the work. All of the effort goes to the coaches. "I just get the privilege of getting the recognition for it all. Cortelyou said. Other instrumental people involved with the La Harpe Summer Ball Program were Jay Jones, Bud Painter, Susan Pratt, Bill Bennett, Richard and Donna Woods. These were a few of the names that Cortelyou mentioned. Cortelyou said, The park district made the program what it is. They are the most giving and sharing group for the community! Cortelyou said, This has been very enjoyable. I am excited because Randy is taking over. He has a lot of energy and the program will keep improving with him." 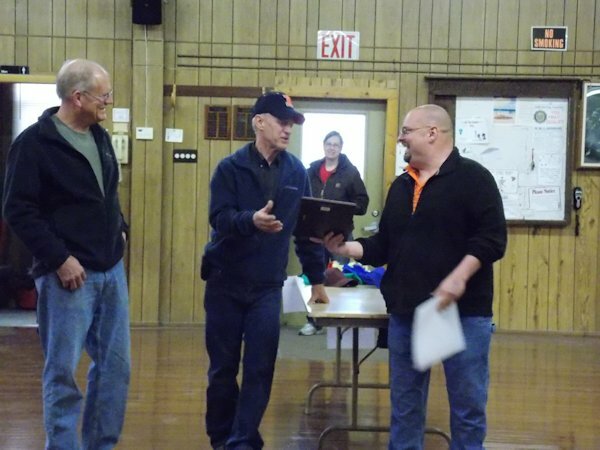 La Harpe men Barry Wright and Randy Shumaker give plaque of appreciation to Larry Cortelyu in recognition of his service to the La Harpe Park District's summer ball program.